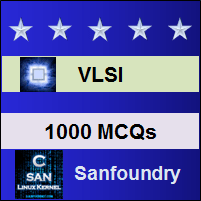 This set of VLSI Multiple Choice Questions & Answers (MCQs) focuses on “Inverter Delays”. Explanation: The resistance value associated with Rp.u. is 4Rs. Resistance is the measure of difficulty to pass an electric current through that material. Explanation: The resistance value associated with Rp.d. is 1Rs. This is the measure of difficulty to pass current through the pull-down device. Explanation: The overall delay of nMOS inverter pair is Ʈ+4Ʈ = 5Ʈ. This delay is the time taken for the input signal to get inverted and arrive at the output. Explanation: The inverter pair delay for inverters having 4:1 ratio is 5Ʈ. This measure of delay is for two inverters, in which the output of the first is given as the input for the second inverter. Explanation: The assymetry of resistance value can be eliminated by increasing the width of the p-device channel. Explanation: The ratio of rise time to fall time can be equated to βn/βp. Rise time is the time taken by a signal to change from a specified low value to a specified high value. Fall time is the time taken for the amplitude of a pulse to decrease from a specified value to another specified value. Explanation: The value of µn = 2.5 µp. This shows that µn value is greater than that of the µp. 8. Which quantity is slower? Explanation: Rise time is slower by a factor of 2.5 than fall time. Explanation: The condition for achieving symmetrical operation is Wp = 2.5 Wn. Explanation: Rise time and fall time is directly proportional to load capacitance CL. Explanation: Rise time and fall time is inversely proportional to Vdd. This shows that if Vdd is reduced fall time and rise time increases.